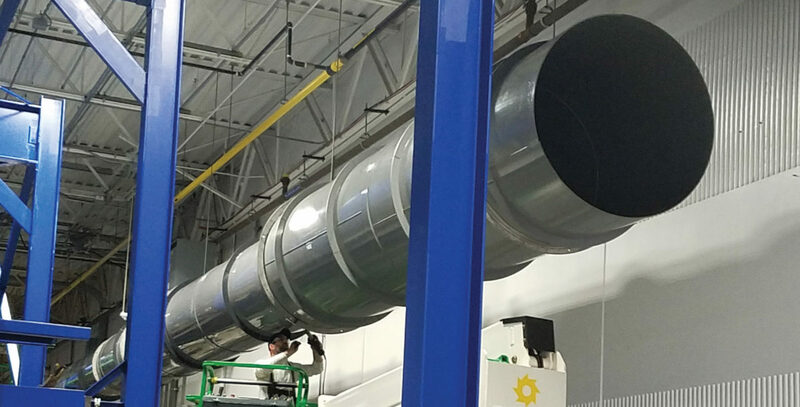 Vanaire PVC ductwork systems are fabricated from 3/16” Type II extruded PVC (conforming to ASTM-D-1784-69) in diameters 6-inches through 24-inches. For diameters greater than 24-inches, Type II PVC sheet stock of 3/16” and ¼” thickness are used (conforming to ASTM-1927-67). In conclusion, Vanaire engineers design PVC ductwork systems that comply with relevant SMACNA guidelines. The fabricated parts are thick-walled and reinforced, so they meet mandated whole-system static pressure requirements. Every component in this carefully engineered ducting system then functions properly, thus assuring high levels of ventilation productivity.